It was one-way traffic in Newcastle as the Lions ran in ten tries against a Combined Country side who were, quite simply, out of their depth. The Lions will surely have enjoyed getting across the whitewash so often and keeping a clean sheet for a first time on tour, but this sort of walkover is unlikely to help them come the first Test against the Wallabies on Saturday week. The Queensland Reds may have given them a workout in Brisbane four days ago, but this was more like after-work drinks for the Lions – and they put them away quickly. Combined Country upped their game in the second half and were more of a force in defence, but the game was over long before that. Yes, the Lions put together good attacking sequences, but Australia won’t be as easy to brush aside as this mixed band and this was not fitting preparation for the challenges that lie ahead. 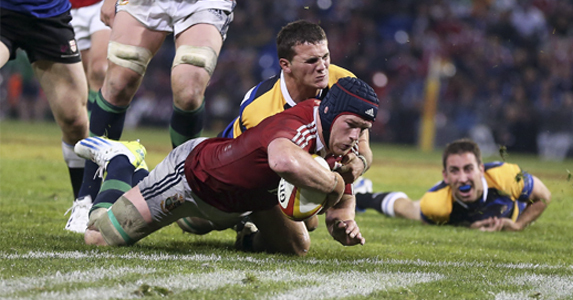 In fact, the way the raft of second-half replacements disrupted the Lions’ game and the drop in intensity as the clock ticked by may be a concern for Warren Gatland & Co.
Sean Maitland and George North linking down the left wing in the 19th minute. Combined Country retained possession well on the Lions line after charging down a Maitland kick, but when the tourists turned the ball over the Scot and the Welshman sprinted down the touchline with the former providing the scoring pass for the latter. So Country blew a viable scoring opportunity and the Lions established a 26-0 lead. The Scot was a surprise selection at fly-half as the Lions coaches opted to give Johnny Sexton and Owen Farrell more recovery time. He hasn’t played at ten since he was a schoolboy, but as he’s the youngest member of the squad that’s not as long as it could have been! As it turned out he played well, more often than not making the right choices in attack. He demonstrated what a dangerous runner he can be with his first-half try, a great gliding arc through the Combined Country defence, and his distribution skills were used to full effect – long wide passes or short pops to support runners, like the one that resulted in Leigh Halfpenny’s touchdown. It was an impressive performance, although that’s not to suggest he should be the fly-half for the Tests. Against such limited opposition, it’s hard to truly judge a players’ Test credentials. There was some great handling, particularly in the back-line, Justin Tipuric show his worth as a support runner, Jamie Heaslip and Ian Evans put in good shifts up front – but the Lions were rarely put under pressure in defence. On the negative side, trying to force the play on occasion led to handling errors – sometimes it’s better just to take contact than throw the risky offload – and a few wayward lineouts could count against Richard Hibbard. The Lions totally dominated. Thet had 68% possession and 74% territory, made 213 passes to Combined Country’s 50 and clocked up 739 metres to a meager 69. There were 12 clean breaks to none and 32 defenders beaten to six – but the 21 turnovers conceded will be a worry. 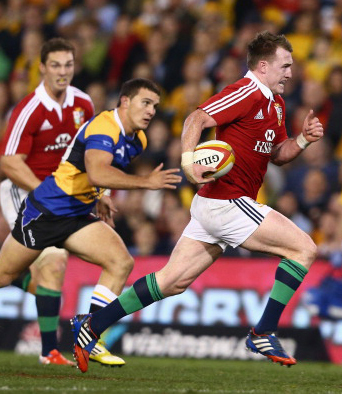 Lions – Tries: Cuthbert, Murray, Hogg, North 2, Hibbard, O’Driscoll, Halfpenny, O’Brien, Davies. Cons: Hogg 4, Halfpenny 3.